Shortly after I had started to develop the Murchison Falls National Park, one Saturday afternoon in January 1954 I happened to be in Masindi. About 5.00 pm I met the Assistant District Commissioner who told me that Mr Hemingway and his wife who were flying round Uganda had lost contact. I suggested that they may have landed at one of the various airstrips in the country and not reported back. As it was near dusk, it was too late to do anything further. Next morning about 9.00 am I went to see the ADC who said that he had not heard any more but he would telephone Entebbe where the main airport was situated. He was told that Hemingway was still missing and asked to make a search. He asked me to search the Park. The Park was some 1500 square miles of uninhabited country bisected by the River Nile with the Murchison Falls at the centre. Apart from myself and a few park rangers, I had a small labour force who were making a track from Masindi to the Nile. The track had not progressed very far. Being Sunday most of the staff had gone off for the weekend. However, I sent those in camp to search. I set off in my landrover with two rangers to do the same. The country was thick with many elephants and buffalo. Having driven across country for some time and thinking that I was achieving very little, I came to a small hill which I climbed to get a better view. After a while I saw a Lancaster bomber and a de Havilland Rapide quartering the Park. The Rapide, part of the East African Airways fleet, was piloted by Capt Reg Cartwright, a good friend to wildlife. The Lancaster had come from Nairobi where I think that it was involved with the Mau Mau rebellion. Then both planes converged on my hill and proceeded to give me a flying display, diving down low, going off and returning to do the same. I much enjoyed the display; stood up and waved my arms. Eventually the Lancaster dropped a message tied to a handkerchief. It said, “Have located plane close to the Falls. Please go there and if all is well, stand on the wing and wave your arms”. I set off in the landrover in the rough direction of the Falls. The actions of the Lancaster were quite remarkable. It sheep-dogged me all the way, if I diverged it dived down to correct my direction. After a while, nearer the Nile, the country became very thick. I could go no further in the landrover. The two park rangers and I then set off on foot, closely watched by the Lancaster which when we diverted corrected our line. Eventually we came to the Falls. The aircraft had crash landed in a small clearing close to the Falls. There were no bodies, no debris and the plane doors were shut. I stood on the wing and waved my arms. The Lancaster waggled his wings in acknowledgement and flew off. It was the middle of the day, very hot and humid. I much envied them returning for a nice cool beer, while I had to walk back to the landrover and then make my way back to Masindi. An old abandoned telephone line from Masindi to Arua in West Nile District ran across the Park and Falls. The cause of the crash was that they had been low flying over the Falls when the plane’s tail wheel caught the line. At that time East African Railways and Harbours ran a large launch from Butiaba up the Nile to view wildlife and the Falls. Arriving this Sunday morning at dawn, they were met by the Hemingways and the pilot who had spent a hot and uncomfortable night in the aircraft, at times being visited by elephants. The party were taken back to Butiaba. In the meantime Cartwright in the Rapide had flown to Butiaba where there was a small little-used airstrip, with a view to taking the party back to Entebbe. However when taking off, the wheels hit an anthill and then a thorn bush at the end of the runway and the Rapide nose-dived. Luckily it did not catch fire immediately. It is said that Hemingway was first out of the plane, remarkably quickly, and the others were got out safely before the aircraft did catch fire. The party then travelled to Masindi by car. That evening the gin stock at the Masindi Hotel was seriously depleted! 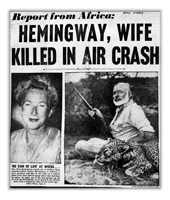 Kampala, Uganda, Monday, Jan. 25--Ernest Hemingway, the American author, and his wife were reported safe today after two plane crashes in the upper Nile country of East Africa. A chartered plane carrying the novelist and his wife on a sightseeing trip cracked up Saturday in the wilds near the Murchison Falls but they were picked up unhurt yesterday by a launch taking tourists to the falls. The launch brought them, to Butiaba, on the shores of Lake Albert, where they boarded a rescue plane. That plane crashed and burned on the take-off, but all aboard escaped unhurt. A police rescue party then took the Hemingways to Masindi and they were reported today heading for Entebbe by road. Mr. Hemingway, who has combined a life of action with writing some of the most gripping fiction in modern literature, left yesterday in a chartered plane from Nairobi, capital of Kenya Colony, on a 600-mile flight over Lake Victoria and Lake Albert to the 400-foot Murchison Falls on the lower Victoria Nile River. This is one of the most inaccessible spots in Uganda--dominated by crocodiles, elephants, buffaloes, lions and other big game--and one of the most beautiful. A search was started when Mr. Hemingway, 55 years old, and his fourth wife, the former Mary Welsh, whom he married in 1946, failed to land at Masindi, an intermediate point east of Lake Albert, for refueling. 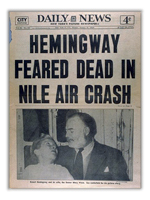 After the plane had been reported missing, a British Overseas Airways Corporation pilot reported he had sighted the Hemingway plane near the lower Victoria Nile. He said the plane was only slightly damaged and that the occupants could have escaped. "One wheel of the undercarriage was broken, but otherwise the plane appeared little damaged," said Capt. 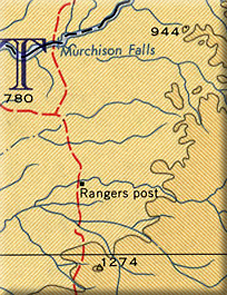 R. C. Jude, pilot of a British Overseas Airways Corporation plane that circled the scene, three miles below Murchison Falls in northwest Uganda. However, neither Captain Jude nor a Royal Air Force search plane pilot who also visited the area saw any sign of life. A police launch was sent from Butiaba, on the east coast of Lake Albert, a journey of several hours from the scene. 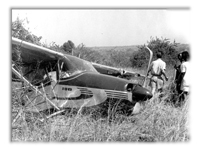 Captain Jude said he had piloted his Argonaut airliner eighty to 100 miles off course to search and saw a silvery Cessna plane lying among scrub trees after he had circled Murchison Falls a few minutes. "It was the right plane without a doubt," he said. "We saw the identification letters VPKLII very clearly." After having noted that the plane appeared little damaged, he added, "I would think the passengers climbed out and made for the river, which was only 300 yards away, but you cannot tell about these things." "It looked like the chap did a neat job of landing the aircraft," he said. He reported the plane had "plopped right into" scrub trees and the thick bush had made it impossible to discover any signs of human life near by, although he circled low enough to see several elephants and buffaloes roaming about on the other side of the river. Not far from the spot, the B.O.A.C. crew saw a small boat drawn up at the river bank. Message Sent to R. A. F.
Captain Jude said he had radioed an R. A. F. search plane that he was circling the area until the R. A. F. plane arrived. Then he flew on to Khartum, the Sudan, and Cairo, where he told his story. 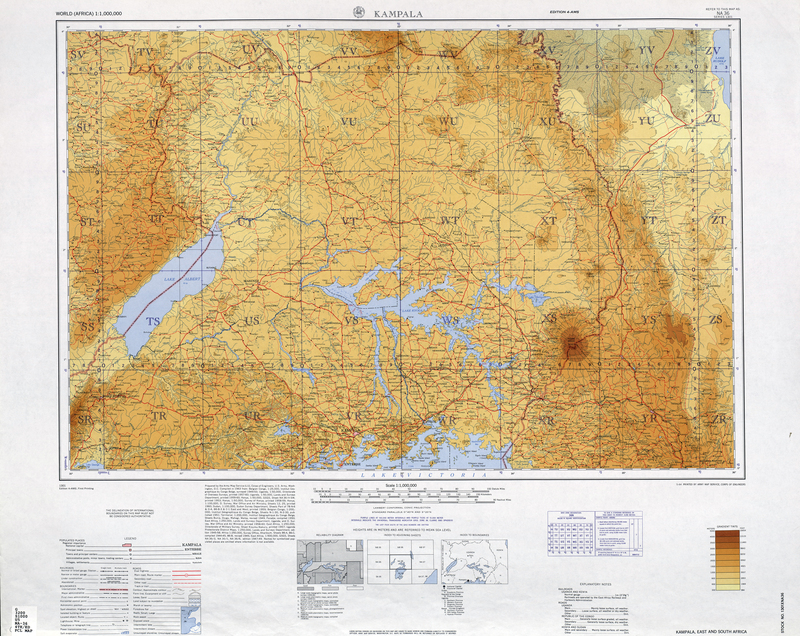 Uganda is a British protectorate in east-central Africa, north of Lake Victoria. Mr. Hemingway has been in Africa for some time, having spent last week at Amboselli National Park in Tanganyika which is dominated by Mount Kilimanjaro, site of one of his most famous stories, "The Snows of Kilimanjaro"